Nationwide, one in 36 commuters are super commuters, traveling 90+ minutes to work each day, spending hours on public transportation or battling traffic. Super commuting is becoming increasingly common: the share of super commuters increased 15.9 percent from 2.4 percent in 2005 to 2.8 percent in 2016. The share of super commuters is highest in expensive metros with strong economies — New York, San Francisco, Washington, D.C., Atlanta and Los Angeles, and in their surrounding areas. Super commuters are more likely to rely on public transportation than those with shorter commutes. An estimated 91.4 percent of non-super commuters drive to work, compared to just 69.7 percent of super commuters. In most U.S. metros, low-income commuters are more reliant on public transportation than high-income commuters, creating a nexus between super-commuting and poverty. When transit usage falls sharply with income it suggests that transit is used out of financial necessity rather than as a lifestyle choice. But the term “Super Commuter” sounds too heroic. “Super commutes” aren’t something to celebrate. People should be free to arrange their lives this way, but shouldn’t be forced to by the housing market. For the commuter, spending three hours of unpaid time a day commuting is only a response to a lack of reasonable alternatives. For taxpayers, it represents a high cost- both in providing infrastructure, and in increased traffic congestion. The US Census itself calls commutes over 90 minutes “Extreme commutes”. That to me, better describes these long commutes- they are something that a few people may have to do because of their job or family situation, but something that shouldn’t be made the new normal. “Extreme” also captures the right connotation. As in “extreme sports,” it suggests something that most people would rather watch than do, and that many don’t even want to hear about. We can also draw parallels between increases in in the prevalence of these extreme commutes and the decrease in overall transit ridership over the past few years. They are both symptoms of the suburbanization of poverty, and to some extent, the middle class. These suburbs are not geometrically conducive to high-ridership transit, and as a result the transit options are poor, so many people who move there, resort to driving. 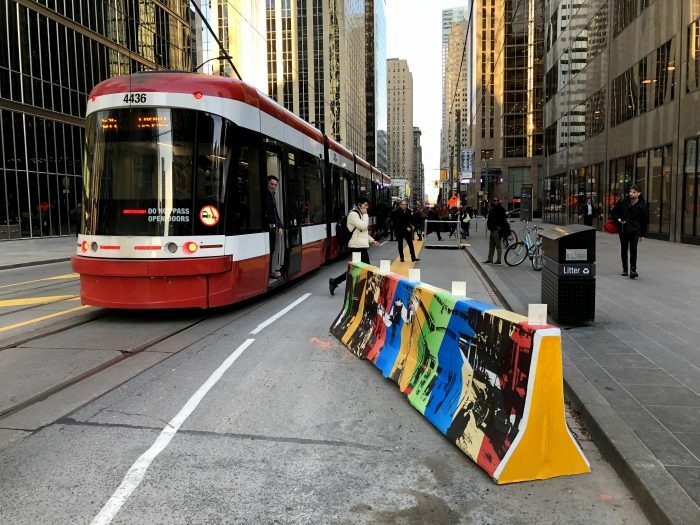 But driving such long distances every day can cost thousands of dollars over the course of a year, so some people would still rather endure the low frequencies and limited spans of suburban transit service to access the city. Reversing the growth in super commuting requires investment in both increasing housing supply and improving transportation. Both increasing housing supply and improving transportation have the potential to reduce commute distances, but the location of this new housing and improved transportation are crucial. Transit always achieves higher ridership per hour of service in dense, mixed-use urban centers, than in unwalkable outlying suburbs, so if we want to reduce the percentage of transit commutes that take more than 90 minutes each way, we will have to substantially increase densities in places where fast, frequent, and useful transit is most feasible. That means a mixture of housing and jobs, and building up, not out. 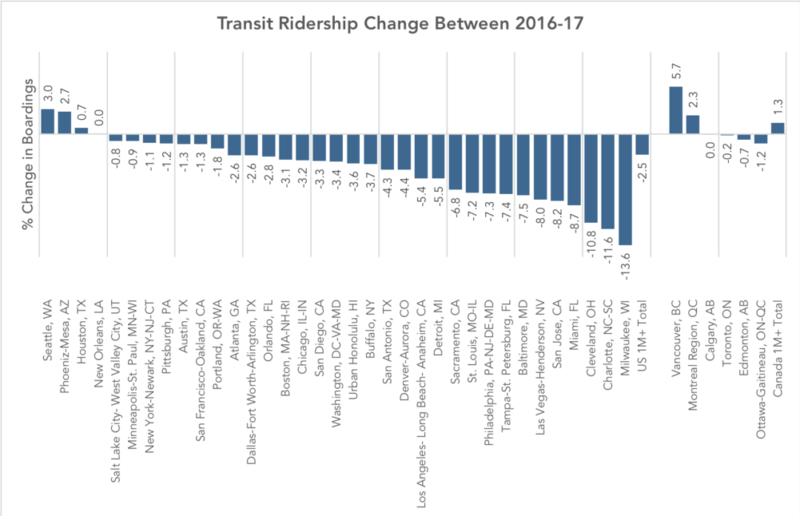 With only a handful of exceptions, transit ridership has stagnated or been falling throughout the US in 2017. The causes of this slump have been unclear but some theories suggest low fuel prices, a growing economy fueling increased car ownership, and the increasing prevalence of ride-hailing services are the cause. A few North American agencies have bucked the trend, including Seattle, Phoenix, Houston, and Montreal. By far the biggest growth was at Vancouver, BC’s Translink, which saw a ridership growth of 5.7 percent in 2017. But notice the big picture: In a year when urban transit ridership fell overall in the US, it rose in Canada. There are three interesting stories to note here. Canadian ridership among metro areas with populations beyond one million is up about 1.3% while regions of the same size in the US saw an overall ridership decrease of about 2.5% in 2017 despite the broad similarity of the countries and their urban forms. Why? Canadian cities just have more service per capita than the most comparable US cities. This results in transit networks that remain more broadly useful in the face of competition from other modes. Note, too, that Canadian transit isn’t cuter, sexier, or more “demand responsive” than transit in the US. 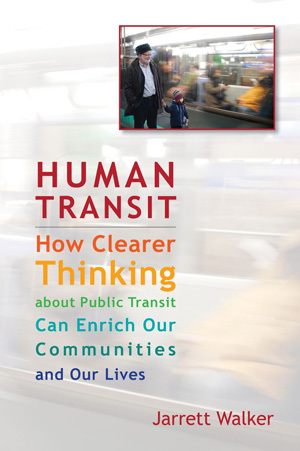 There is simply more of it, so more people ride, so transit is more deeply imbedded in the culture and politics. Vancouver’s transit ridership has historically been higher than many comparable regions as a result of decades of transit-friendly land-use and transportation policies, including an early regional goal to foster density only around the frequent network. (The Winter Olympics also had a remarkable impact: ridership exploded in 2010, the year of the Olympic games, but then didn’t fall back after the games were over; apparently, many people’s temporary lifestyle changes became permanent.) By North American standards, Vancouver is remarkable in the degree to which development is massed around transit stations. But Translink attributes its 2017 ridership growth to continued increases in service, high fuel prices, and economic growth. The 11km (7mi) Millennium-line Evergreen Extension just opened prior to 2017, directly adding over 24,000 boardings a day. Fuel prices in Vancouver have also reached an all-time high, at $1.5 CAD / litre (4.4 USD/ gal), an anomaly in North America, although still lower than in Asia and Europe. Economic growth has also been consistent, with the region adding 75000 jobs in years 2016 and 17. 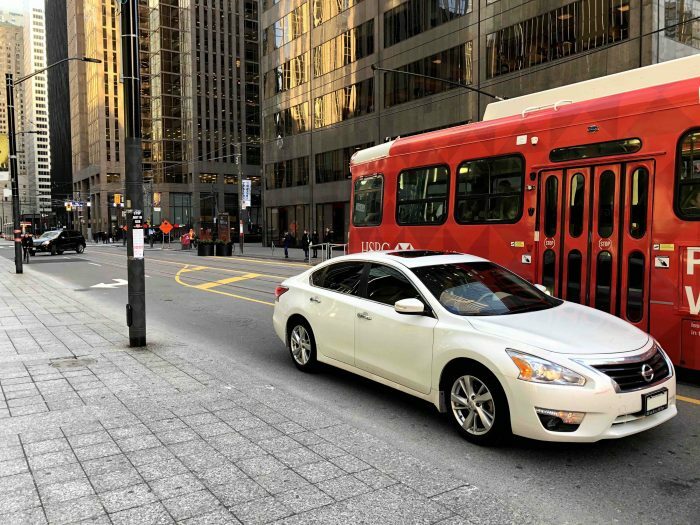 Notably, ride-hailing services like Uber and Lyft are not available in Vancouver due to provincial legislation. Many commentators suggest economic growth to be a factor of the 2017 trends in transit ridership but there seems to be two conflicting theories, with economic growth cited as both a cause ridership growth and a cause of ridership decline. The positive link is obvious- economic growth leads to more overall travel, some of which will be made by transit. Contrastingly, the negative link is based on the theory that increasing incomes allow for more people to afford cars. Both theories seem plausible, but for both to be true, the relative strength of each must differ between cities. Most likely, economic growth in transit-oriented cities is good for ridership, and growth in car-oriented cities, which encourages greater car dependence and car-oriented development, is bad. This would explain the roaring success of Seattle, Vancouver, and Montreal, though it doesn’t explain why Houston and Phoenix are doing so well. 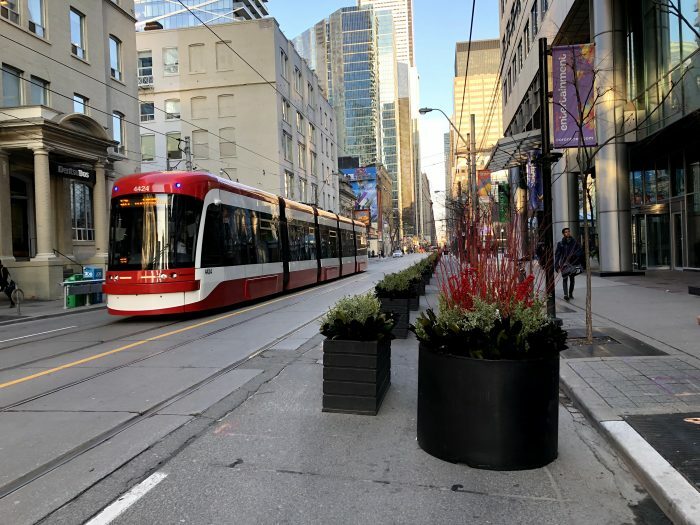 As North American cities work to reverse last year’s losses in ridership, they may best learn from Canada, and a select few American cities, to leverage economic growth for ridership growth. For Americans, Canada is the world’s least foreign country. There are plenty of differences, but much of Canada looks a lot like much of the US, in terms of economic types, city sizes and ages, development patterns, and so on. So why is Canada so far ahead on transit? All Americans should be asking this. Ask: Which Canadian city is most like my city, and why are its outcomes so different? We’ll have more on this soon. Alfred Twu lives in the Bay Area and is a long time transit rider. He has studied architecture and business and is also an active participant of the cooperative movement, having worked in artist, food, and housing co-ops. He is also an illustrator for my forthcoming book Human Transit. Also known as cooperative living, co-ops, communes, intentional communities, or living with roommates, shared housing creates challenges and opportunities for transit service. It can increase density without zoning changes or construction. However, good transit service needs to already exist for this to happen. As such, shared housing's greatest potential is in increasing utilization of under-zoned but well served neighborhoods. Shared housing denotes a group of unrelated people live in a single dwelling unit. Kitchens, bathrooms, and other living areas are shared, bedrooms may be shared or single occupancy. In the Bay Area, this model is known as a co-op or cooperative. Note that the word co-op has an entirely different meaning on the East Coast. Shared housing has a long history in the Bay Area, dating back to boarding houses. The modern Bay Area cooperative housing movement began in 1933 with the founding of the Berkeley Student Cooperative. Although some structures are built with shared housing in mind, usually the building is simply a repurposed large house. For example, Ridge House, a 38 person student co-op, used to be a mansion, while Cooperative Roots, pictured below, houses around 20 people in two adjacent single family houses. What does this have to do with transit? Let's look at two neighborhoods: one dense, and one sprawling. The denser neighborhood will usually have better transit service. Now, if zoning ordinances prevent additional housing from being built in Sprawlville, that does not mean it's the end of the story. While zoning typically concerns itself with units per acre, the density that matters for transit service is population per acre, or more specifically, commuters per acre. This is where shared housing comes in. When a neighborhood of single family houses goes from having one or two working adults per house, to having 4 to 8 working adults, as far as transit is concerned, it's a high density neighborhood. The catch to this though, is that this can only happen where there is already good transit service. When a group of people share a house, they'll all want easy access to their jobs, which may be in different directions. Not all of them will take transit either – some of them will need to drive to their jobs, some people prefer to bike. This is why shared housing works so well with college students – everyone is going to the same place for their "job", so only one frequent route is necessary. A number of my friends who used to live in shared housing as students have formed their own communities after graduation. Most are now in their mid 20s to early 30s. Some work office jobs with traditional 9-5 hours, others work retail jobs with varying hours. Over the last few years, about 30 communities of 4 to 18 people have been formed. Most cluster around the Ashby rail rapid transit station. Let's examine why. It is about halfway between the two big job centers in the area: UC Berkeley and Downtown Oakland. It is 20 minutes on rapid transit to the region's largest job center, downtown San Francisco. It is close to freeway on-ramps. It is on flat ground and within biking distance of a large number of commercial districts. Bike access is important since transit service in the evenings and on weekends is limited. It is not in itself a downtown district. This means there are a lot of large houses with lots of bedrooms and yards – the preferred housing type. There are already other co-ops in the area. The one co-op not near a BART station — an outlier near the bay — is an artists' warehouse. The Ashby station neighborhood, which currently consists of mostly single family houses, had long been targeted by planners for transit oriented development. It has an underground rapid transit station with train frequency of every 7 minutes on weekdays and 20 minutes at night and on weekends. Ashby station neighborhood. Station is blue, parking lot is black. However, the official plan to build 300 units of housing on the station parking lots met significant neighborhood opposition. Existing residents were concerned about losing the flea market that currently operates on weekends in the parking lot, increased traffic, and future upzoning of the area. The project was put on hold in 2006. Shared housing, however, has achieved something similar with no official intervention. Can the Ashby model be replicated elsewhere? Members of a shared house with long commutes tend to move out. Therefore a location needs good access to members' existing jobs, and potential future ones. Transit is just one part of the equation – those working 9 to 5 hours downtown. For the other members, good car and bike access to nearby commercial areas is needed for those working retail and service jobs on evenings and weekends. The Ashby area community began with just a couple of houses. However, the community grew rapidly as the original residents' friends also wanted to live nearby. UC Berkeley provided a feeder system with many members having already familiarized themselves with shared housing through living in the Berkeley student co-ops. In places far from colleges, immigrant neighborhoods can also benefit from the feeder effect. One of the side benefits of shared housing is a group of residents will have a lot of purchasing power with their combined incomes, and will seek out the area that meets their needs best. Until most people live in shared housing, this means that a region will likely have only a small number of preferred neighborhoods. Why not MacArthur? Station placement matters. The next station down the line, MacArthur, is even better positioned in terms of access to transit and jobs. However, this station is located in a freeway median. As a result, a lot of the land walkable to the station is either paved over, or so close to a freeway that it is an unpleasant place to live. As a result, even though this area has been zoned for multistory apartments, few have been built. Shared housing in the Ashby area occurred without any official planning – an existing community (recent UC Berkeley graduates) simply moved in. Where no existing community exists, social hubs such as coffee shops or community centers, located inside or directly next to the station, can aid the formation of the close relationships that shared housing requires. Sometimes, we have to think in triangles. Can We Make Density Make Sense?